Download "YOU DON T ALWAYS NEED A REALTOR TO SELL YOUR HOUSE FAST"
3 Introduction One decides to sell their home because of several reasons. The reasons can be moving to another city or shifting to another home which is more spacious; in some cases if they have inherited a house instead of keeping it for themselves, they would like to sell it or if they are facing liquidation. Not only these, there would be some other reasons to sell their home to get themselves out of debt. To sell your home, there are two choices, one is selling your home through FSBO which means for sale by the owner and the second choice is using a realtor where you list your home in MLS by which you find potential buyers for the home. As per the current crisis which has hit the housing market, selling off a home is a daunting task. Consumer confidence has diminished extensively and vendors of homes are depressed when they plan to sell their homes. In actual fact even though the numerous efforts made to remedy the situations such as tax credits, low interest rates with low price while there is no loss, we have few tricks for the deal that one can spend to guarantee and make their home be prominent from the rest which can be sold at a reasonable price. 4 Before the selling procedure of your house starts Before you sell your home or after selling it, there are some significant points to be considered. Firstly prepare a home selling plan by choosing either of the options, decide whether to sell your home by FSBO as owner or make use of realtor, the procedure that involves is practically identical. If one decides to make use of a listing agent, you should make sure that you choose an agent who will hold your best interests. A well negotiated listing agreement is must if you are planning to sell your home at a good price. 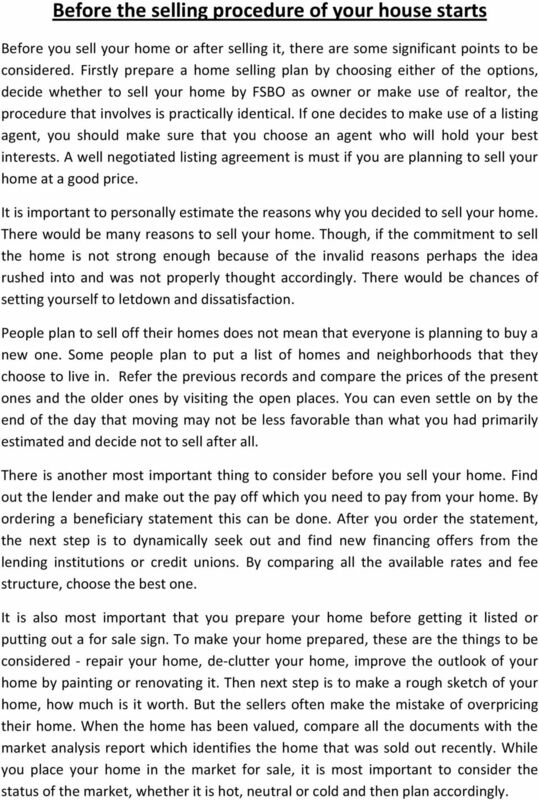 It is important to personally estimate the reasons why you decided to sell your home. There would be many reasons to sell your home. Though, if the commitment to sell the home is not strong enough because of the invalid reasons perhaps the idea rushed into and was not properly thought accordingly. There would be chances of setting yourself to letdown and dissatisfaction. People plan to sell off their homes does not mean that everyone is planning to buy a new one. Some people plan to put a list of homes and neighborhoods that they choose to live in. Refer the previous records and compare the prices of the present ones and the older ones by visiting the open places. You can even settle on by the end of the day that moving may not be less favorable than what you had primarily estimated and decide not to sell after all. There is another most important thing to consider before you sell your home. Find out the lender and make out the pay off which you need to pay from your home. By ordering a beneficiary statement this can be done. After you order the statement, the next step is to dynamically seek out and find new financing offers from the lending institutions or credit unions. By comparing all the available rates and fee structure, choose the best one. It is also most important that you prepare your home before getting it listed or putting out a for sale sign. To make your home prepared, these are the things to be considered - repair your home, de-clutter your home, improve the outlook of your home by painting or renovating it. Then next step is to make a rough sketch of your home, how much is it worth. But the sellers often make the mistake of overpricing their home. When the home has been valued, compare all the documents with the market analysis report which identifies the home that was sold out recently. While you place your home in the market for sale, it is most important to consider the status of the market, whether it is hot, neutral or cold and then plan accordingly. 5 The next step is to market your home, make your home as attractive as possible. Find the most appealing selling points and use those points while you advertise your home. A good and foremost step is to take on a specialized photographer for the snaps of your home and you can post the same snaps on the internet or with the listing agent. This is to make your home as a preferred choice from the listed homes. The internet makes you a profitable idea on selling your home, use it and make sure that you increase traffic and interest in your home. One way to ensure that interest grows would be posting photos of your home with a brief description online. Lockbox is a good alternative while your home is shown. Sometimes if people are planning to sell their home, they should know that they should opt to sell their home during holidays as it is likely to result in a lower price for your home where no matter what the realtor says. 6 As a home owner, you should know With the economy being the way that it is, everyone wishes to save a buck or ten while they sell their home. Below are the listed important things everyone has to know before you sell the home: 1. Amount of exclusion Strange is that many people able to exclude gains from the sale of a home from their income. 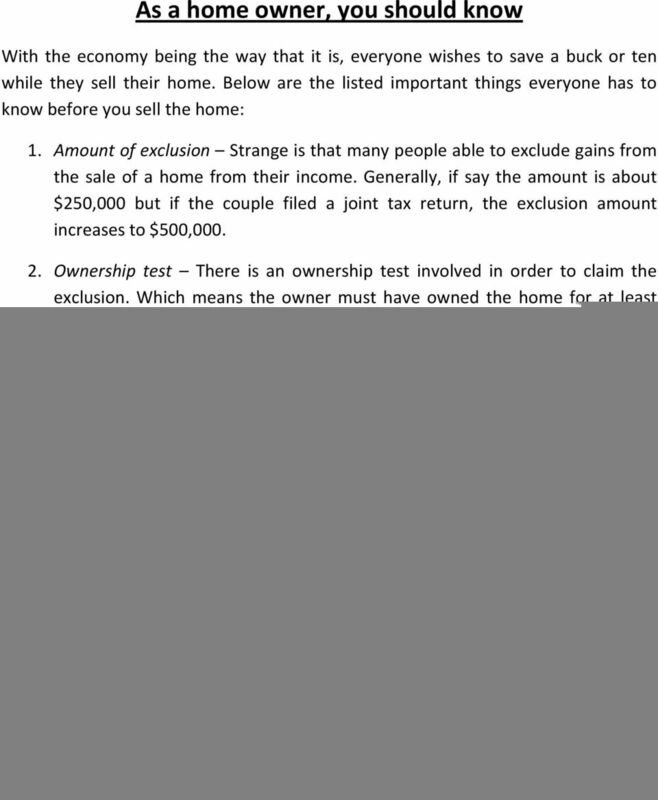 Generally, if say the amount is about $250,000 but if the couple filed a joint tax return, the exclusion amount increases to $500, Ownership test There is an ownership test involved in order to claim the exclusion. Which means the owner must have owned the home for at least two years during a five year period which is the end date of sale of the home. 3. Use test The home have to lived in and used as the primary home for two years during that five year period. 4. When not to report If all of the gain from the sale of the home is excluded, then it is not required to indicate the sale of the home in your federal tax returns. 5. Reporting taxable gain If there is gain made in the sale of home that cannot be legally excluded, then this gain is taxable and one has to make use of Schedule D in the tax return to report this. 6. Deducting a loss It is not possible to deduct a loss from the sale of your home. 7. Rules for multiple homes If one owns more than one home, then gain may be excluded from the sale of the primary home and therefore tax must be paid from gains made from the sale of any subsequent homes. The definition of the primary home is the home where you and/or your family reside in most of the time. 7 Planning to sell your home Selling a home using a realtor has some good points; it is not always the best interest of the seller to have one. The main reasons why people using realtors while selling their homes is to have CMA (competitive market analysis) report which help you in comparing the price of your home and other homes in the same neighborhood which has lately sold out. To get listed their home by which people looking for a home can able to view the list. 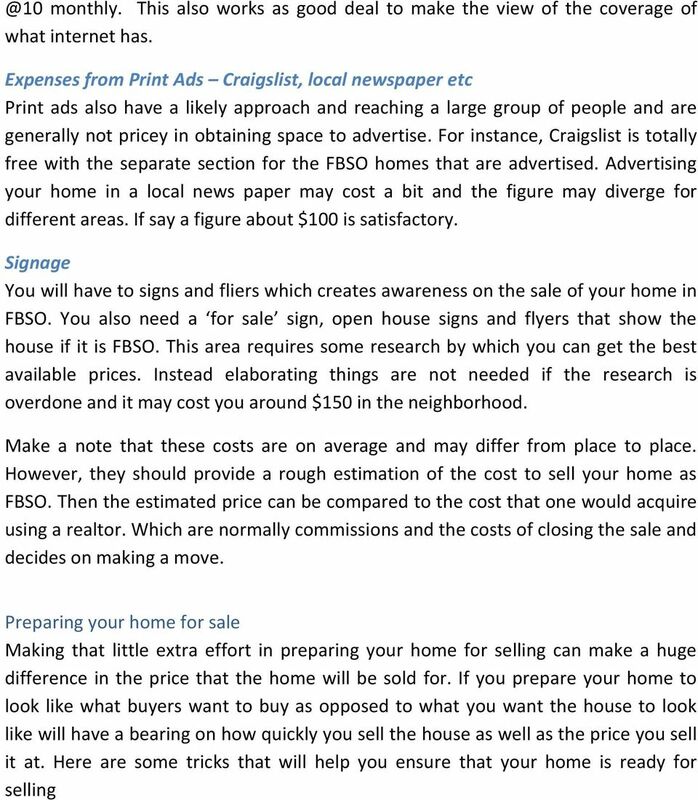 Both these issues can be deal easily if one decides to become a FSBO (For Sale by Owner). For one, CMA report can be generated by realtor for $100 dollars. Most of the realtors offer you this service at no cost in order to become your client. Make sure that this service makes you with under price or over price for their home. Though, if you want the realtor with his service then make sure you clear everything from the commencement. 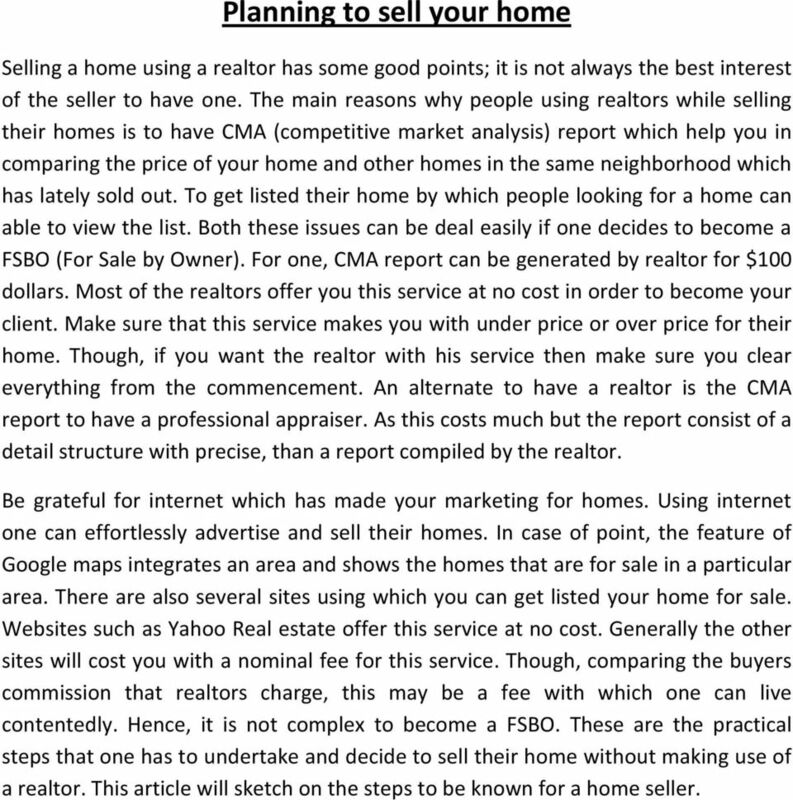 An alternate to have a realtor is the CMA report to have a professional appraiser. 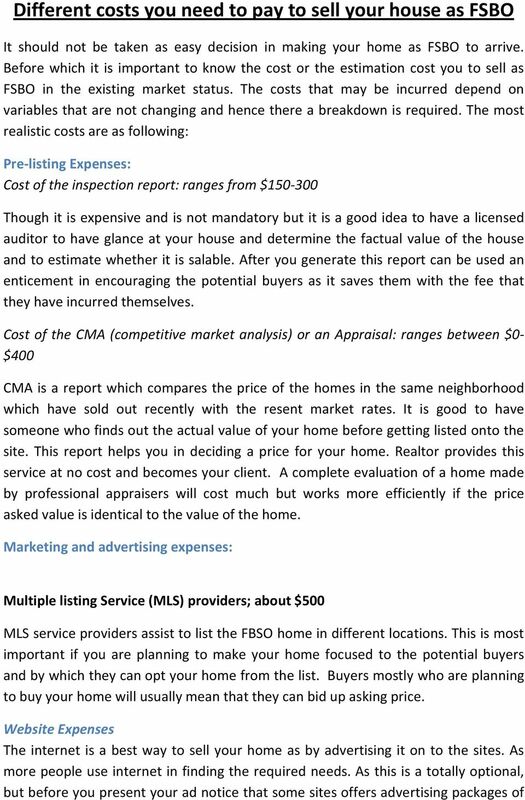 As this costs much but the report consist of a detail structure with precise, than a report compiled by the realtor. Be grateful for internet which has made your marketing for homes. Using internet one can effortlessly advertise and sell their homes. In case of point, the feature of Google maps integrates an area and shows the homes that are for sale in a particular area. There are also several sites using which you can get listed your home for sale. Websites such as Yahoo Real estate offer this service at no cost. Generally the other sites will cost you with a nominal fee for this service. Though, comparing the buyers commission that realtors charge, this may be a fee with which one can live contentedly. 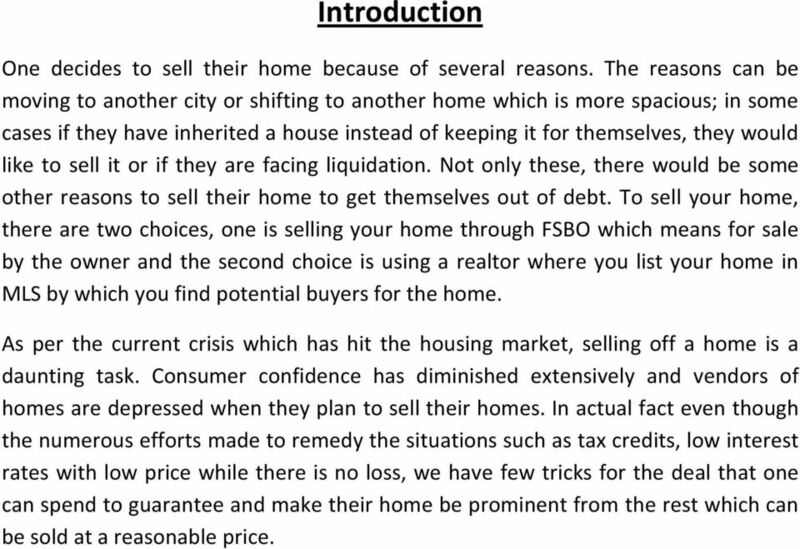 Hence, it is not complex to become a FSBO. 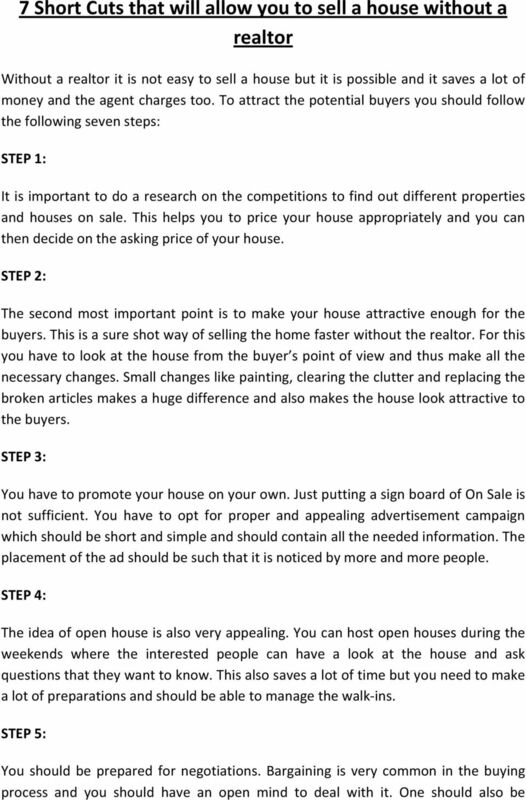 These are the practical steps that one has to undertake and decide to sell their home without making use of a realtor. This article will sketch on the steps to be known for a home seller. 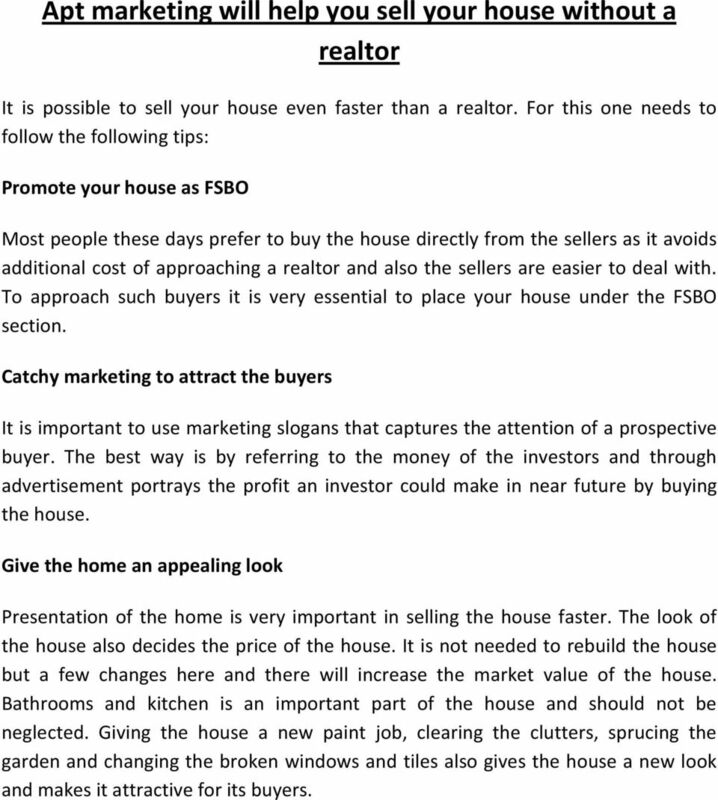 10 Tips that will help you sell your home faster than FSBO It is a very good idea of selling the home as FSBO if there is no equity as it will be easy to get a buyer. A systematic approach is important to sell the home without the use of a realtor. The housing market has undergone a lot of change and the focus should be on selling the home during this recession period. 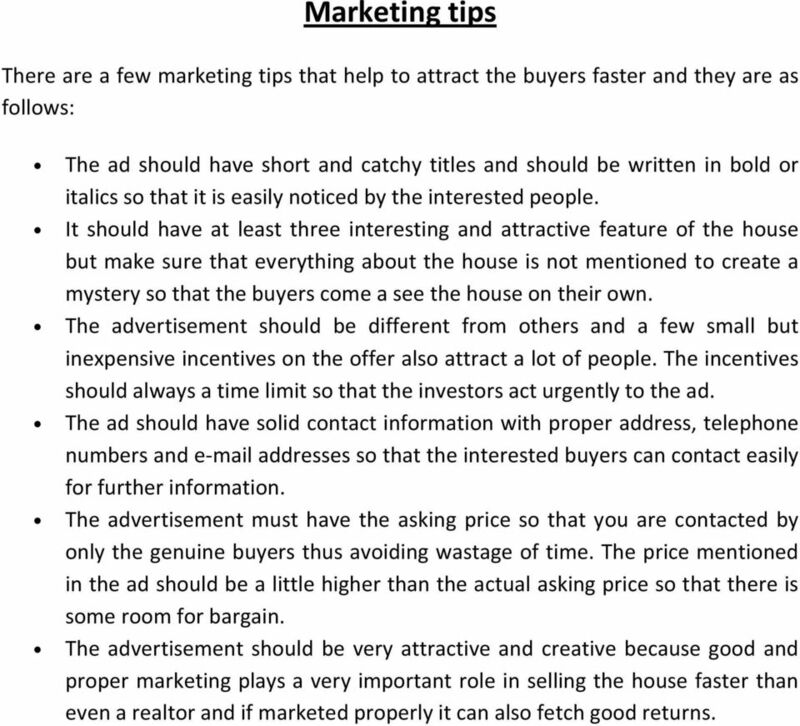 The four useful tips mentioned below will help to sell the home faster. 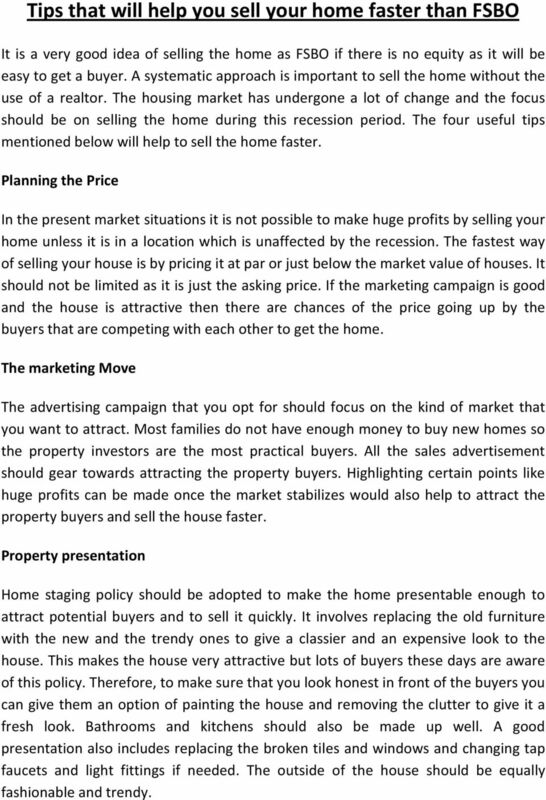 Planning the Price In the present market situations it is not possible to make huge profits by selling your home unless it is in a location which is unaffected by the recession. The fastest way of selling your house is by pricing it at par or just below the market value of houses. It should not be limited as it is just the asking price. If the marketing campaign is good and the house is attractive then there are chances of the price going up by the buyers that are competing with each other to get the home. The marketing Move The advertising campaign that you opt for should focus on the kind of market that you want to attract. Most families do not have enough money to buy new homes so the property investors are the most practical buyers. All the sales advertisement should gear towards attracting the property buyers. Highlighting certain points like huge profits can be made once the market stabilizes would also help to attract the property buyers and sell the house faster. Property presentation Home staging policy should be adopted to make the home presentable enough to attract potential buyers and to sell it quickly. It involves replacing the old furniture with the new and the trendy ones to give a classier and an expensive look to the house. This makes the house very attractive but lots of buyers these days are aware of this policy. Therefore, to make sure that you look honest in front of the buyers you can give them an option of painting the house and removing the clutter to give it a fresh look. Bathrooms and kitchens should also be made up well. A good presentation also includes replacing the broken tiles and windows and changing tap faucets and light fittings if needed. The outside of the house should be equally fashionable and trendy. 11 Putting up financial confidence With the current market conditions most people thinks that the house is being sold out of desperation and will try to bargain quiet a bit at the first go. So it is very essential not to show financial crunches and desperation. Points to remember while selling a house as a FSBO Selling your house through a realtor or through FSBO is virtually same. It is thus important to learn the below mentioned tricks from the professionals. Look at the house as a buyer and not as the owner. This will make you present your house more attractively by making all the needed changes. The view of friends and relatives are also important and paying attention to all the criticism and praises helps to improve the look of the house. The location and the neighborhood of the house also play an important role. The price of the house should match the market value of the other houses in the same locality. The terms and conditions of sale should be very clear. It is also important to check whether the buyer qualifies as a mortgage lender to avoid all the inconveniences later. To avoid the contract to be rendered invalid it is important to maintain a checklist of time frames of contingency removals, submission of documents, inspection of reports and other deadlines. 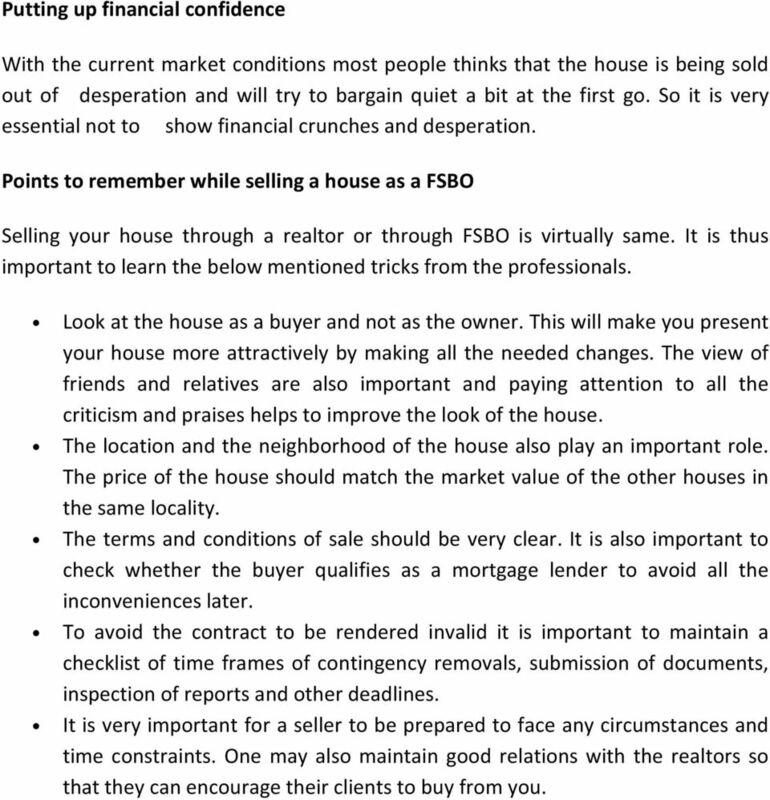 It is very important for a seller to be prepared to face any circumstances and time constraints. One may also maintain good relations with the realtors so that they can encourage their clients to buy from you. 13 prepared to meet the perspective buyer halfway if they want a reduction in the asking price. 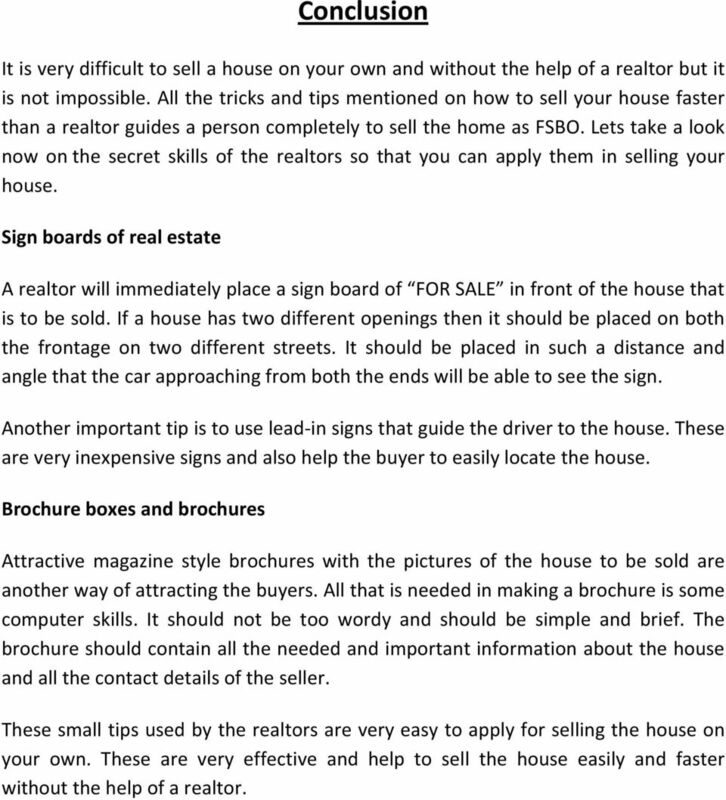 STEP 6: Before coming to the buyer about the buying price, it is very important to arrange all the papers in order. You should have all the plans in place so that the contract is written quickly. The contract should have all the terms and conditions and also the final selling price. You should also so some research about the sales contract and transfer titles to be prepared for the closing of the deal. STEP 7: It is also advisable to choose a title company which takes all the responsibility to handle the escrow of the house. Such companies takes the charge of overseeing the final process of selling the house which includes getting all the loan documents together, recording the deed, getting the insurance and closing off the loan. The above mentioned seven steps are very useful in selling the house faster on your own without the help of a realtor. 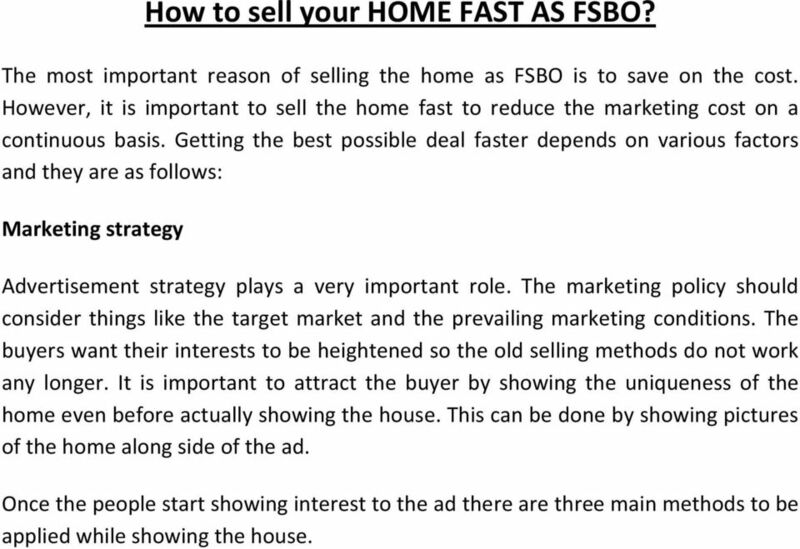 14 How to sell your HOME FAST AS FSBO? The most important reason of selling the home as FSBO is to save on the cost. However, it is important to sell the home fast to reduce the marketing cost on a continuous basis. Getting the best possible deal faster depends on various factors and they are as follows: Marketing strategy Advertisement strategy plays a very important role. The marketing policy should consider things like the target market and the prevailing marketing conditions. The buyers want their interests to be heightened so the old selling methods do not work any longer. It is important to attract the buyer by showing the uniqueness of the home even before actually showing the house. This can be done by showing pictures of the home along side of the ad. Once the people start showing interest to the ad there are three main methods to be applied while showing the house. 15 Mass showing in an event style For showing the house you must plan the entire event. It also helps to save a lot of time and energy. An event like a party can be organized where all the interested people are invited to come and view the house. It creates a competition amongst the buyers and there are chances of yours to increase the asking price. This works very well especially if the house is trendy and fashionable. Personal showings and up close This means showing the house to the different buyer s one at a time. This helps you to know about the person better who is going to buy the house and is very beneficial if you are very attached to your house and it also helps you to form a relationship with the buyer. It also gives the seller a chance to show the confidence in the house to the potential buyer thus justifying the asking price. Virtual tours Virtual tours of houses are a new style of showing houses to a large audience and are quite effective. This is especially very beneficial to the buyers who stay overseas or in a different state. The buyers can have a look at the house before taking deciding to make an offer. It is a very simple process and can be easily done with a digital camera. The only trick is to click high quality photos of the best areas of the house and upload on various online properties market sites. You can take the help of a friend or even a professional if you are unable to take good photographs. The above mentioned ways of selling the house as FSBO has proved to be very effective. It completely depends on the seller and the circumstances for the method that he chooses to sell the house all on the own. It helps to sell the house easily and quickly even without involving the realtor and also saves on the cost. 16 Apt marketing will help you sell your house without a realtor It is possible to sell your house even faster than a realtor. For this one needs to follow the following tips: Promote your house as FSBO Most people these days prefer to buy the house directly from the sellers as it avoids additional cost of approaching a realtor and also the sellers are easier to deal with. 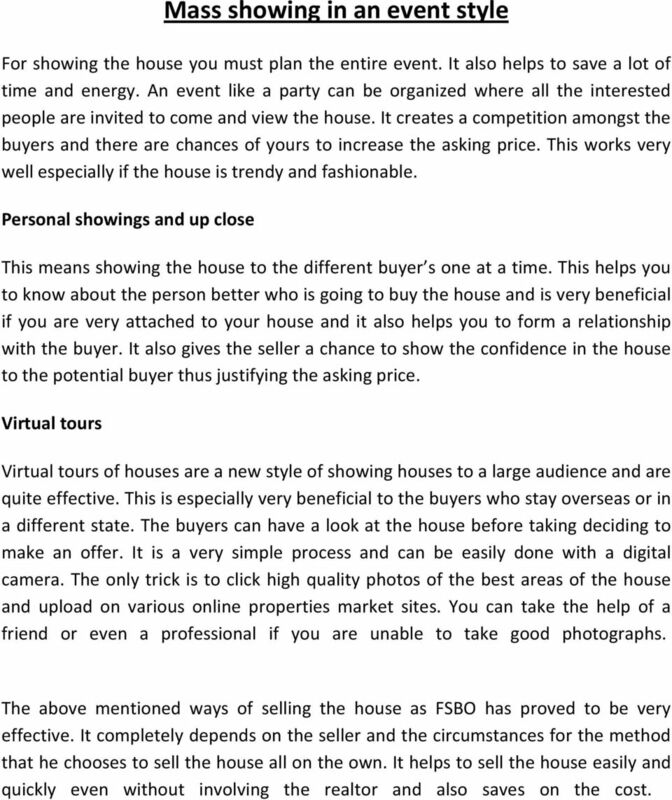 To approach such buyers it is very essential to place your house under the FSBO section. Catchy marketing to attract the buyers It is important to use marketing slogans that captures the attention of a prospective buyer. The best way is by referring to the money of the investors and through advertisement portrays the profit an investor could make in near future by buying the house. Give the home an appealing look Presentation of the home is very important in selling the house faster. The look of the house also decides the price of the house. It is not needed to rebuild the house but a few changes here and there will increase the market value of the house. Bathrooms and kitchen is an important part of the house and should not be neglected. Giving the house a new paint job, clearing the clutters, sprucing the garden and changing the broken windows and tiles also gives the house a new look and makes it attractive for its buyers. 17 Marketing tips There are a few marketing tips that help to attract the buyers faster and they are as follows: The ad should have short and catchy titles and should be written in bold or italics so that it is easily noticed by the interested people. It should have at least three interesting and attractive feature of the house but make sure that everything about the house is not mentioned to create a mystery so that the buyers come a see the house on their own. The advertisement should be different from others and a few small but inexpensive incentives on the offer also attract a lot of people. The incentives should always a time limit so that the investors act urgently to the ad. The ad should have solid contact information with proper address, telephone numbers and addresses so that the interested buyers can contact easily for further information. The advertisement must have the asking price so that you are contacted by only the genuine buyers thus avoiding wastage of time. The price mentioned in the ad should be a little higher than the actual asking price so that there is some room for bargain. The advertisement should be very attractive and creative because good and proper marketing plays a very important role in selling the house faster than even a realtor and if marketed properly it can also fetch good returns. 18 Other important factors It is suggested that having some neutral tones in the house is essential. Even though right now it can seem a bit bland and boring, in the long run it does appeal to everyone. Now, not everyone has a preference for bright colors in their bedrooms or their home. So you should remember that when you are buying your home the interiors should also be appealing. The bright orange or stark red room may appear to you like a darling during the day. At night the same room would appear to be a menace. The issue is that you have to keep on repainting it time and again. 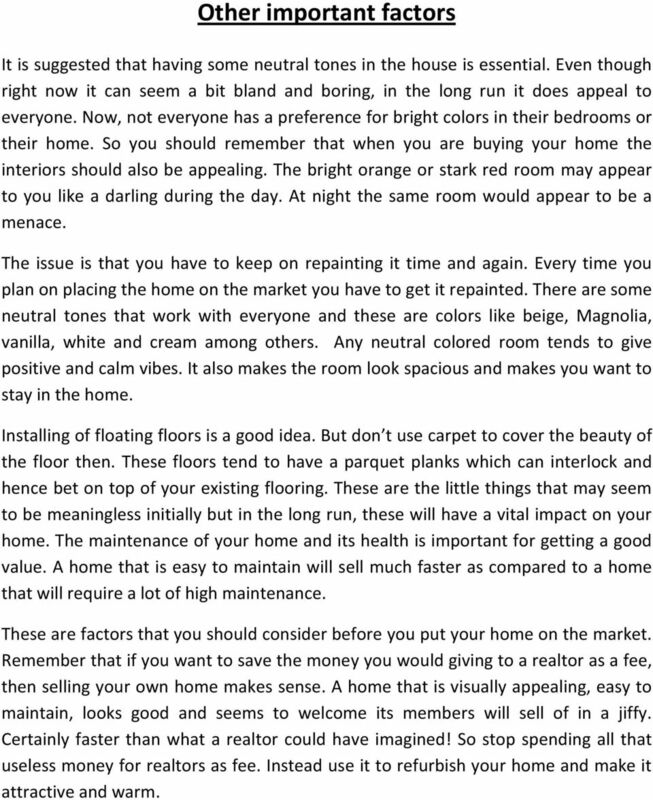 Every time you plan on placing the home on the market you have to get it repainted. There are some neutral tones that work with everyone and these are colors like beige, Magnolia, vanilla, white and cream among others. Any neutral colored room tends to give positive and calm vibes. It also makes the room look spacious and makes you want to stay in the home. Installing of floating floors is a good idea. But don t use carpet to cover the beauty of the floor then. These floors tend to have a parquet planks which can interlock and hence bet on top of your existing flooring. These are the little things that may seem to be meaningless initially but in the long run, these will have a vital impact on your home. The maintenance of your home and its health is important for getting a good value. A home that is easy to maintain will sell much faster as compared to a home that will require a lot of high maintenance. These are factors that you should consider before you put your home on the market. Remember that if you want to save the money you would giving to a realtor as a fee, then selling your own home makes sense. A home that is visually appealing, easy to maintain, looks good and seems to welcome its members will sell of in a jiffy. Certainly faster than what a realtor could have imagined! 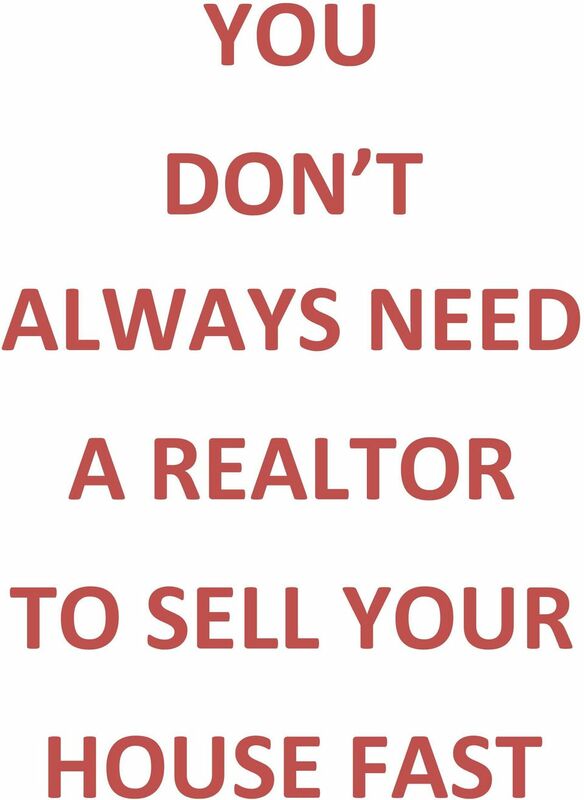 So stop spending all that useless money for realtors as fee. Instead use it to refurbish your home and make it attractive and warm. 19 Conclusion It is very difficult to sell a house on your own and without the help of a realtor but it is not impossible. 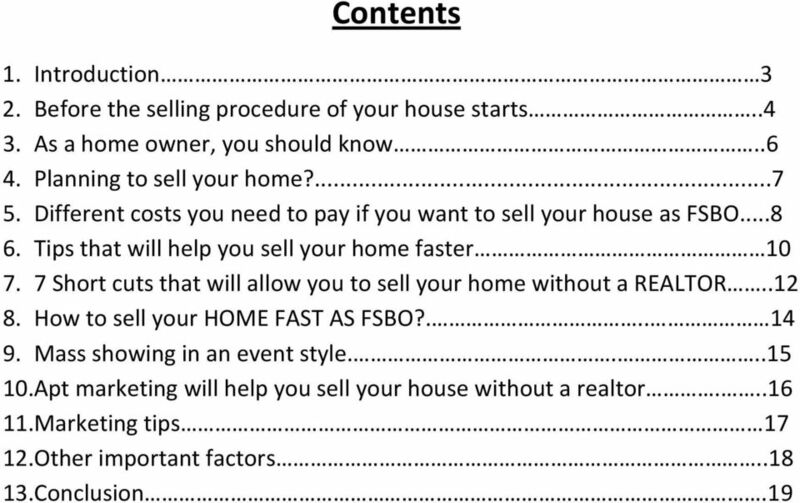 All the tricks and tips mentioned on how to sell your house faster than a realtor guides a person completely to sell the home as FSBO. Lets take a look now on the secret skills of the realtors so that you can apply them in selling your house. Sign boards of real estate A realtor will immediately place a sign board of FOR SALE in front of the house that is to be sold. If a house has two different openings then it should be placed on both the frontage on two different streets. It should be placed in such a distance and angle that the car approaching from both the ends will be able to see the sign. Another important tip is to use lead-in signs that guide the driver to the house. These are very inexpensive signs and also help the buyer to easily locate the house. Brochure boxes and brochures Attractive magazine style brochures with the pictures of the house to be sold are another way of attracting the buyers. All that is needed in making a brochure is some computer skills. It should not be too wordy and should be simple and brief. The brochure should contain all the needed and important information about the house and all the contact details of the seller. These small tips used by the realtors are very easy to apply for selling the house on your own. These are very effective and help to sell the house easily and faster without the help of a realtor. Some dream of a lifetime, other accedent there!... Become owner. The best investment opportunity real estate of the decade... WWW.INVEST-LASVEGAS. selling Your complete guide to selling preparing your home for sale, choosing the right agent, advertising and presenting your property.